So far, we've looked at the brow in detail because I've argued it was a very important little piece of metal. I've shown lots of versions of this shape, and stated I think its shape is so influential for the cabin's look in regard the boats lines. 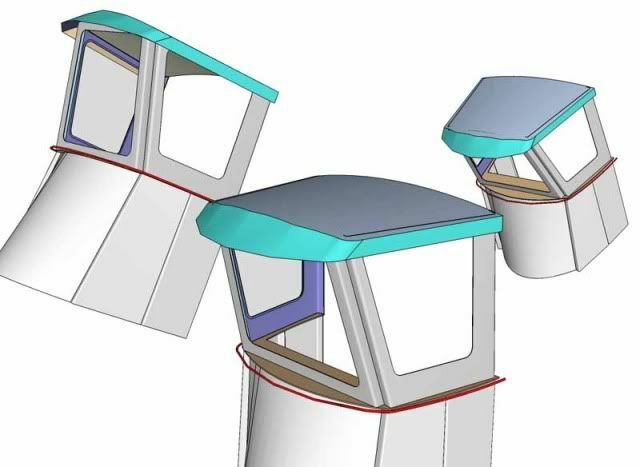 IF you review the Glen-L catalog you'll see lots of different cabin lines; if you view anyone's design catalog you'll find different brow lines; and if you online and search you'll find a wide variety of this design element employed by designers. Now, we'll look a bit at the layout or scribing and marking of the cuts. Not the only way to do this work, certainly, and as most one off home builders don't use software to develop surfaces; I'm showing here some rudimentary methods of marking so that cuts with hand power tools could result in clean lines and finely edged welds. 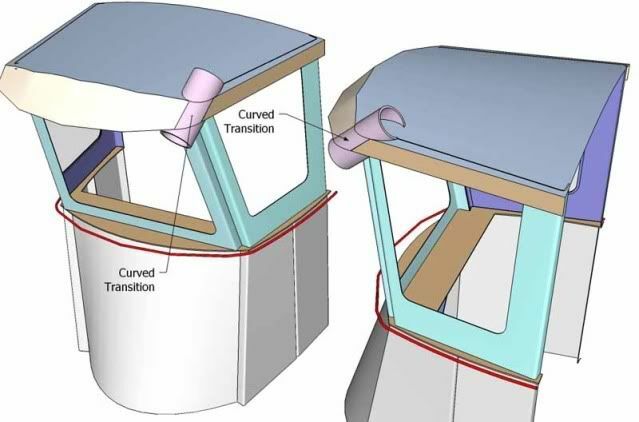 By holding a plate/sheet piece to the cut arc on the top of the cabin, the edge of the brow can be marked reaching behind or below the intersection of the two pieces when held in this position. 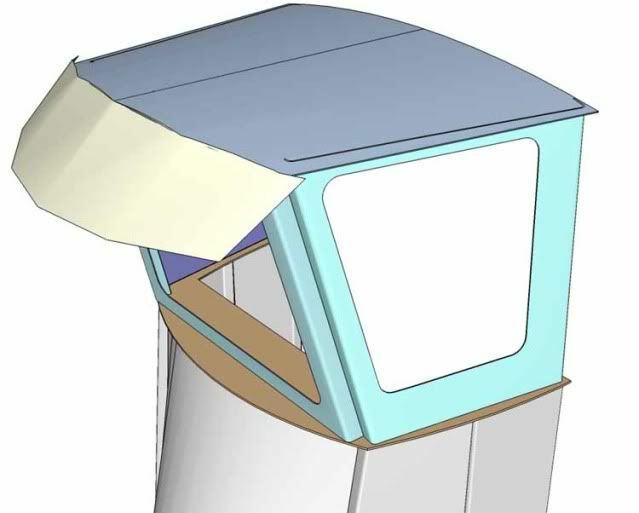 I've drawn the top edge cut, but in previous views you can see that any material thin enough to bend without rolling and extending above and below the cabin top will work as a blank. A means to get the angle or rake correct is to put a set of temporary 'sticks of aluminum' tacked to the top- where one stick is at the angle in Profile View the other holding it up like a leg. Or; cut ply wedges and hold them to the brow blank while its in place. All work related techniques depend on the 'crews' size 1 set to lots of sets hands means different methods make sense. Once the blank is cut and tacked up... if the cabin is built on the shop floor, which may not be the case, its possible to strike the lower brow curve using a straight edge and several ares shown here. The image illustrates the method of striking the lower line by holding the aluminum bar extrusion at differing distances (width of the brow vertically) and when this is held in place the bar may be vertical or raked slightly and again these intersecting cylinder will create a VAST , large number, huge amount of different curves of intersections. If the reader wanted to correlate this very unassuming image to the work done to build the boats in the photos above, then click back and forth and the relational geometry will hopefully start to emerge? Some of the brows we've seen have nearly horizontal lower edges, but others have a echoing curve upward in the transverse sweep. This is where some of the beauty of this shape becomes a subtle set of interrelated intersecting curves. Regardless how refined the shape- these ideas shown are the basic building blocks for laying out and building your own version of an attractive (to you) cabin brow. While not an exhaustive exploration of this windscreen covers' shapes, we've explored the three main contributions to the brow and cabin top shape. First is the camber of the cabin top as it could contribute to the brow's shape. Next is the combinations of the Plan View radius of the brow and the Profile View rake so the brow. These elements are the main influences on this functional but aesthetically pleasing piece of metal that shades the windscreen, sheds water and stylizes your cabin. but what about some corners and hand rails? We're getting closer to having a full cabin design build method shown here at the Forum, where it belongs. Let's continue with some more details and start by finishing the brow's outboard corners. IN a few of the boat photographs posted above, the brow is mitered or butted to the side brow plates, and that is not unattractive but also isn't quite as elegant as the forward curved surface curving into the side surface. This image summarizes the geometry: a segment of a cylinder of tighter/smaller radius. All the curved corners we've seen are is this segment of another cylinder. Often in small cabins this piece can easily be cut from a piece of pipe, as I show here- 6" pipe. 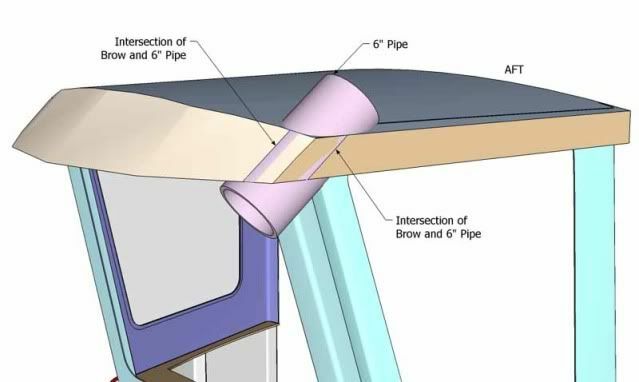 This image just shows the pipe surface in its finished orientation as part of the two adjoining surfaces but leaving the entire pipe visible so the origin of that piece is recalled in this sketch. In the image (next) above I left the two plate surfaces (browns) to show how all three intersect on tangents to the pipe's wall. Back to our cabin overall from different points of view, the added detail of a curved brow corner transition from the side to forward surfaces is shown here, and the blend of these three surfaces seems a nice refinement to me. Here is one such pipe wall segment used in the brow of a 25'er's cabin top. Note the brow extends down from the top but there is a lower lining or 'sub cabin top' structure in this design as well? I hope this corner image helps to show the sketches in real life construction? The upper edge of the pipe wall segment is not trimmed in this progress photo of this cabin's brow construction. One important point to make about this cabin design- the lines are subtly curved fore and aft- for the most part. This implies a vast increase in work, laying out and cutting the curves (#1); Fairing the cuts, and tacking up long sweet seams that could be bent :doh: (#2); and welding a lot of seams in relatively thin materials that is a major time contribution if you're coming to this work for the first time. I'm not suggesting that this design is appealing to the wider boating audience, my Skipper (here) had lived on the water for his entire life, was very esoterically concerned about every design detail and was vocal and influential about every curves' nature and extent. He was a pleasure to work for in design and building as he would spend time considering and responding to the aesthetics of the work, making my work for him a nice challenge to meet. Not all owners are as concerned with the overall look of their craft and therefore lots of work was done in this cabin that might be considered too expensive for other boats? I agree with anyone who says " it took lots more time" ( Read: Mo' $$$$ !!) but I'm personally pleased with the results of the extra effort and if you're building your own cabin; I think its worth your time to explore these details to consider if they're worth your time. Let's keep going by finishing some other details of cabin building. This is a good thread, keep it going. it is nice to read about how things work together to get a proportional correct lines on the boat. 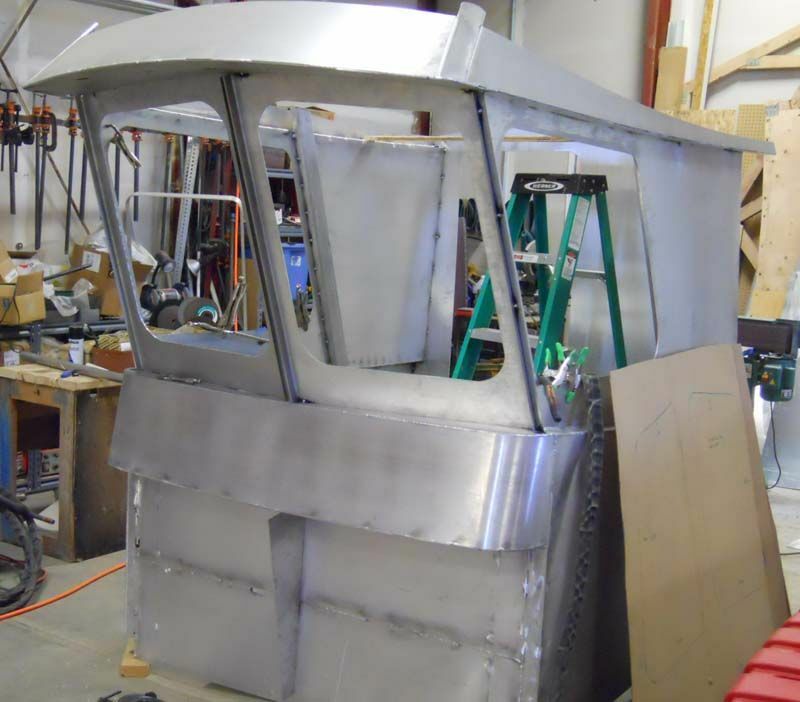 I know a guy that builds in steel, and he built a custom workboat, had hard square transom corners, then he took a section of pipe as you similar mentioned above, and made a rounded corner transom. What a big difference that made in the looks. How a small change can add so much to the general lines is amazing at times. Great job covering the cabin building and design. Any chance you could do something similar on building doors and door jams? I have spent a lot of time on boats and all the boats I have been on look like they have had the doors rebuilt a time or two. Dillon, I'm working on a drawing project right now, no time to spend drawing for cabin post. Maybe later this winter- not sure on my free time. Doors and windows are often purchased as complete units because of the complexity of the smaller details required to do a good job on them. For example, very specific extrusions are used for aluminum window frames and those extrusions are usually 'owned' or exclusive to a given window manufacturer's purchase. They've invested in tooling to bend, shape and a procedure to combine metal and glass into a 'drop in' product. That is true of doors as well, in fact many of the window vendors sell doors as well. We'd like to see photos of your work? Not sure if you have a build thread going? Looking forward to seeing your project. These postings are such a wealth of information. Thanks again Kevin!. I've been pondering how to transition my wooden cabin with curves and I think this will help immensely. Thanks again. Mr. Intense, I'd be happy to help explore any details shown - in a wooden version- if that might help in planning. Took a project recently that requires most of my day's work so while I may not be able to answer in a day's span? I will try to watch the site, and field suggestions of how the shapes may be constructed or planned to be built in wood- as a part of replies? I'd help if I can- done a bit of wood work in the past, so its possible I may be some assistance- likely not much!! I have lots of 3/16" sheet left and this winter plan on using my cheap OSB floor sections as templates and finally weld in the side floors and removable center floor sections. I am currently still using a temporary center console and a soft bimini top (from my sailboat) rigged to provide shade and some rain cover. I love the look of the Alaska cabins, but as mine is really used mostly on hot summer days, and some fall / incIement fishing days, am leaning to staying mostly open, rather than a full cabin. But, my boat is a bit wet - if you are heading straight into a chop it is dry, but if you cross a chop in about any angle, with the wind up around 20 knots, the wind will drive the spray back everywhere. I have angle chines. 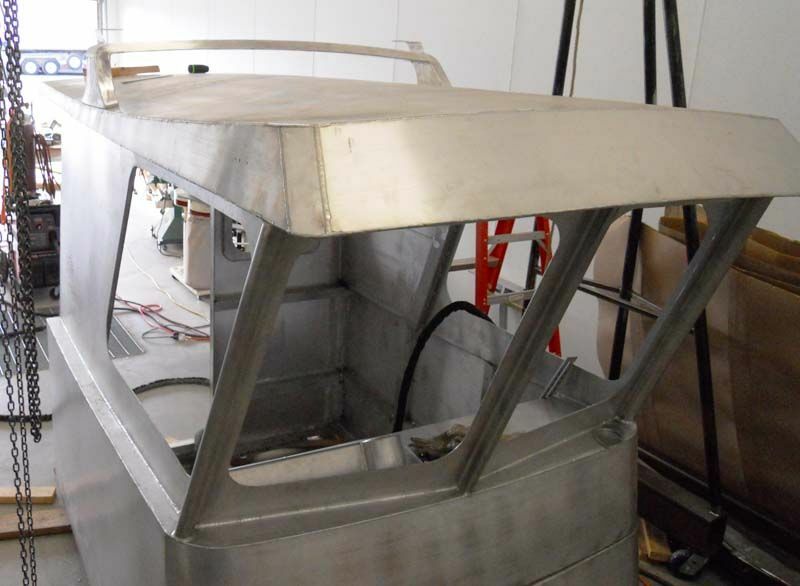 I am thinking of making a rigid aluminum top, supported by 4 main pipe corner posts from the gunwales up to the top. Something like the top of the "Wilkes workboat" in this thread pics but all open and supported only by pipe posts. Then I envision a set pf maybe 4 - 6 large lexan panels which can be stored on board but slid in along a track between the gunwhales and top to make side windows, and somehow between posts ahead of the CC to give a front rain/ wind screen. Other than adding onto the CC / redoing with a small recessed head somehow, I have no need for a full enclosed/ covered forward cabin or v-berth. I know this is a loose description but do you think that 4 corner posts could support a top of approx 10 -12 ft long, and maybe 7-8 feet wide? Or, I could add intermediate/ middle posts if required. I plan on some sort of channel / track which would allow the lexan to slide in and out. I am not looking for a fully watertight cabin here with the lexan but rather panels which can be put in to keep out most of the large spray/ splashes. I was thinking of 1/8" or 3/16" aluminum sheet for the top (as I have leftover 3/16") with an frame and crossmembers of perhaps small size square or rectangular tube if you wanted top add your thoughts or recommendations. I would appreciate any help you could provide - by the way, the boat does have the box keel modification you suggested a few years ago, rather than the flat plate keel per the plan. PS - added a pic at the dock as the beach pic shows the bimini top set too high. it is approx 2.5 - 3ft from the gunwale/ rail to the top where I need it. the description is a little vague so my reply may not address the cabin ideas you pose? Depending on the size of pipe, four corner posts (like legs of a table?) will support a top. 1" pipe would be a bit thin but 3" would be way overkill. The lengths versus the diameter determine the slenderness factor for columns. If the pipes' plastic panel tracks provide adequate added stiffness (?) they could allow the use of a 1-1/2" or 2" pipe vertical that would cope with the static wt. The issue seems to me running and wave motion forces? 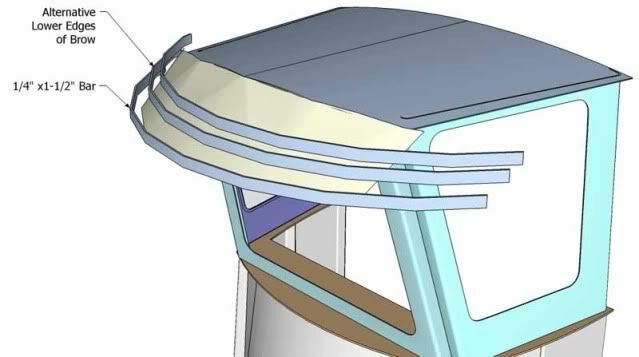 if the corners are just pipe uprights not plate/sheet intersections- seems like it would 'wiggle'/flex/sway depending on the hull motion forces and the wind's (apparent wind too) effect on the top? I notice the T top builders- who use mostly all pipe/tube make 'trussed' shapes of their top frames. They use small diameter pipe/tube but in pairs with webbing to obtain stiffness while remaining light wt in overall structure. on a boat this size 1/8" should be more than plenty for the top- 3/16" regardless if its on hand - seems unneeded wt up that high on the boat? 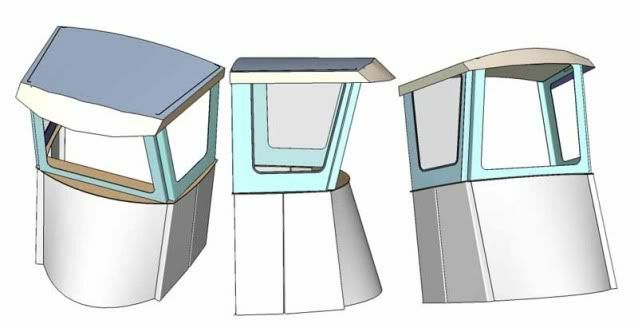 Framing the top can be done in various ways- several shown in this thread, above, but if the design is based on a 'table leg' type of structural concept (?) then I believe two long 'beams' or side supports will be needed to span, fore and aft, between the two posts on each side in order to carry any cabin roof top. If the top could be pressed formed? then bending the 10' long edge to a J (on its side) where a 4-6" vertical and a 2-3" 'return' is bent under the top- this could form the basis for a beam between the corners? IF I were in your design situation-planning a top- I'd look to the T-Top builders' sites for designs for cabins/covers/shelters/doghouses/weather helm enclosures that were based on pipe/tube supports of hardtops. I get the feeling they've "been there and done that" and what they show (sell) would address most of what they've learned making this type of product for sale to all sorts of boats? Thanks for all of the observations, ideas and comments! I was thinking of pipe in the 2 or 2 1/2" range for the verticals, but as you mention, perhaps "copying" the t-top designs of smaller bridged piping would be worth a look. I had not thought of press braking/ forming for strength -so I will now consider that. I had thought of a doing a bend a few inches from the side edges, just as a bit of a sun shade/ drip edge but I do like your idea. I may opt to buy a sheet of new, thinner material - I do want to save weight, but money is not plentiful on this build, so if i have extra 3/16", when i am done the floors, it will be tough to buy more new material. I will likely mock something up early this winter. Here is the link to my long thread with Kevin long time ago, I finally found it. I wanted a stand up helm, and Kevin posted a lot of good ideas from the Pacific Dory genre. I hope no one minds me butting in. Here's a thought: I've done numerous 'lids' and have never been that satisfied with the results. I've framed them fore and aft, I've framed them athwart, I've had crenulations pressed in them, applied broad squashed channels above and so on so forth. There is this issue of broad thin panels that MAY need to be welded continuously either athwart or longitudinally - a thing that gives pause - for the obvious reason. Very recently I came up with something (as I was falling asleep) that rather delighted me with the result when I applied, in the round, my hypnagogic fancies. I thought of a roofing experience I had while working in the Aleutians on Adak Island. Too long a story but it had to do with a bunch of 'Standing Rib Aluminum Roofing'. Alas I do not contain Kevin's rather remarkable ability to screw things down with nearly excruciating detail, so bare with me here: In this drawing which is exaggerated scale wise, we see the concept. Of course, this is running fore-aft. Other than it is prominent, it obviates the need for a long problematic weld, and it works both weld wise and material wise. One way or another if the lid is broad, one is faced with a long athward or fore-aft weld on thin material. THEN, I roll 1x2x1/8" rec. tube to conform to the prescribed LIDcrown 24" o.c. athwart. I'm hoping this makes sense?